Just In: Men's and Women's Mizuno Wave Rider 18 running shoes. This shoe remains classified as a low-cushion neutral shoe with a heel-to-toe offset/drop of 12mm. The shoe weighs in at 9.2 ounces for men and 7.8 ounces for women. The upper is completely redone with a more open mesh and the run-bird logo attached to the eyelet seams as well as the outsole to help enhance the wrap of the midfoot. The usual ideal heel fit of Mizuno remains, and helps the shoe create a snug fit throughout and makes the shoe feel like an extension of the foot. 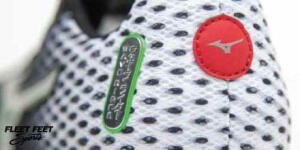 The midsole remains on the U4ic blend, but the wave plate is now a Parallel wave made of the same material that was found on the Rider 16, giving the shoe its signature bounce once again. Increased flex grooves in the midfoot add flexibility giving the Rider a smooth transition throughout the cycle. All in all, the revamped version makes this shoe the light, springy ride that Rider lovers of versions 12 and 16 will enjoy.